As a paranormal researcher, investigator and blogger sometimes working in Ohio, I absolutely fell in love with the idea of this book. 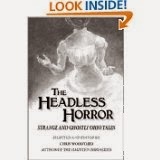 Written by my favorite paranormal Ohio author, Chris Woodyard, The Headless Horror was packed full of vintage newspaper articles from the 1800s and into the early 1900s on a variety of paranormal subjects. Tales of ghosts, hauntings, UFOs, Fortean phenomena, ghostly pranks, and much more came from all corners of the state and were presented in their original format. Where applicable, the author has added additional commentary and research to explain more fully the events discussed. In my own work, I spend many hours poring over old newspaper articles but I've never been so lucky as to stumble across so many paranormally themed articles as Woodyard has managed. The sheer bulk of original articles combined with the extra research makes this book a great resource for anyone doing any type of paranormal investigation of the Buckeye State. This is also an interesting book for anyone interested in history, as it provides a firsthand account of so many fun, historical tidbits, such as the methods of grave robbers and the methods to stop them. For some, however, this book might be somewhat of a dry read...the original language of articles written by 19th century journalists isn't always the fluid, straight to the point language that people of this century appreciate. And, due to the nature of the work, its format doesn't have the same easy flow as a narrative; its a little choppy in some places, making it an ideal work to read in chunks. Overall though, I give this a solid two thumbs up! It's also come to my attention that this particular title is actually the second in a series featuring these vintage newspaper articles! Oh, and if you were wondering about the title...the "headless horror" mentioned is in reference to the famous Pearl Bryan decapitation that shocked the Cincinnati area and those who have visited Bobby Mackey's will especially appreciate. Edited to Add: Interestingly, I just looked up the Amazon reviews for the Chris Woodyard book, and apparently I was channeling another reviewer!